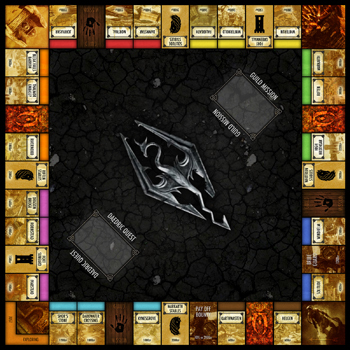 What it lacks in official endorsement, this fan made Skyrim-themed Monopoly board more than makes up for in geeky attention to detail. Crafted by DeviantArt user "oddeh," the "board" is essentially a giant graphic overlay designed to be dropped on top of existing Monopoly game boards that replaces the old property squares with more Dovahkiin-centric locales. For instance, "Boardwalk" has been replaced with the town of Solitude while the "Community Chest" and "Chance" card piles have been replaced by "Guild Missions" and "Daedric Quests," respectively. Likewise, the board eschews the original game's colorful motif for a darker, Skyrim-appropriate aesthetic. Imagery from the game abounds, and monocle-faced elderly gents take a backseat to gruff barbarians wearing horned iron helmets. Oddeh even went to the trouble of designing new faux money, modeled after in-game coinage. If this adaptation is lacking anything however, its a suitable analogue for Monopoly's iconic character pieces. It would be a flawless redux of the game if only Oddeh had replaced that tiny metal dog with a miniature dragon. Granted, after that idea I'm running a bit low on thoughts for what might replace the thimble or that stupid top hat, but I'm sure the game offers an analogue for each of the Monopoly items. Maybe a glowing basket of Nirnroot, or one of those blue butterflies that's always fluttering just out of reach. Assuming you can look past this minor flaw, the board is available for download in sizes up to 6,000 by 6,000 pixels, so those of you inclined can print the thing out and drape it over that copy of Monopoly you found at a yard sale three years ago, yet never actually pull out of the closet.